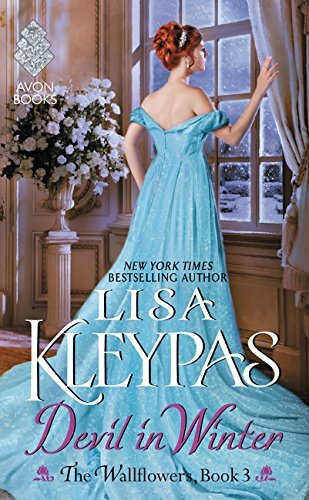 The Romance Dish: Lisa Kleypas Announces a New Devil! Rarely have romance readers rallied around a redeemed bad boy as they have with Sebastian, Lord St. Vincent, the hero of the third book in Lisa Kleypas' Wallflowers series, Devil in Winter. Sebastian, Evie and their love story regularly rank near the top of readers' all-time favorites. Many times over the years, I've wondered about these two. Where are they? How many children did they have? Are they happy? I missed them! Well, guess what? THEY'RE BACK!!!!!! ...then click here to read the teaser excerpt from Devil in Spring. I know. I know. We have to wait a whole year for this story. It's not fair, right? Except! Kleypas has another bright and shiny, brand new book all ready for release on May 31st and it's a winner! Marrying Winterborne tells the highly anticipated story of Rhys Winterborne: coarse, self-made, Welsh, department store magnate and shy, sheltered, too-good-for-his-touch, Lady Helen Ravenel. These two are so, so good together! Both are so much more than they appear on the surface and their journey to love is classic Kleypas in all the very best ways. Marrying Winterborne is one of the best books I've read this year. It's one of the best books I've read in many years. Not only have Rhys and Helen secured places among my favorite Kleypas couples but they are high on my list of all-time favorite couples by all authors. Mark your calendars for May 31st. This is one book you won't want to miss! Are you as excited about the return of Evie and Sebastian as I am? What other beloved romance couples would you like to see in a new book? I loved the sweet glimpse into Sebastian and Evie's HEA. How fun that Sebastian is still a bit of a devil! It's not fair, though, to tease us and then make us wait so long for the book. I guess I will have to be satisfied with Marrying Winterborne for now. After reading your mini-review, I am moving it to the top of my TBB list! I know, it's terrible to have to wait so long! I hope you enjoy Marrying Winterborne as much as I did! This is delightful and special. I would enjoy reading the novel. Dain & Jessica are a couple whose lives I would continue to follow. I think a lot of people would be thrilled to follow along with you! I'd love it if Loretta Chase would write a short follow-up to Lord of Scoundrels, to let us know what Jessica and Sebastian have been up to. Do they have kids? What kind of father has Dain turned out to be? Does Jessica still wear gloves? I am looking forward to the Kleypas books, both this year's and next year's. Thanks for the update on Evie and her Sebastian. I'm sure there a whole lot of readers out there who would love to revisit Jessica and Dain! I can't wait for both books! Today I am going to reread my keeper copy of Devil in Winter. I'd also love it if Mary Balogh had some romances about the next generation of Bedwyns. Balogh would have readers lining up to buy more Bedwyns. I was already super excited about being only a bit over two weeks from reading Marrying Winterborne. With this news, I'm so excited that I'm only a breath away from hyperventilating. I. Can't. Wait. I love LSUReader's idea of a Jessica-Dain update! I'd also love an update on Connie Brockway's Lily and Avery from My Dearest Enemy--and there are a couple of secondary characters in that book whose stories I have wished for since I first read the book in 1998. I agree with Jessica and Dain. I would also like to see Julie Garwood revisit some beloved characters. YES! I agree with this!!! I've not read this series but I'm sure I would enjoy it Honestly, I am so behind in series but I still look forward to them and my favorite authors - Keeping up with Grace Burrowes and all her characters to look forward to. I saw the clip yesterday and am way excited!!! Sebastian is definitely near the top for my fave Kleypas heroes! Love to read this series. Mary Balogh books are wonderful. About flippin' time and lemme go hit the Wishlist before I forget. Oh my God ! These two books are going to kill me! In a wonderful way of course! Sebastian and Evie, my all time faves!!! I can hardly wait! She's one of the few auto-buy historical authors for me and I loved Sebastien and Evie. I think I'll go have a reread. I really can't wait until 2017 for this to come out. It sounds utterly delicious. I love Lisa's books. The first book that I read of hers was "Mine till Midnight", and I've been a huge fan of hers ever since. Lisa writes wonderful couples and I cannot wait to read Marrying Winterborne & Devil in Spring!! What exciting news! I've re-read "Devil in Winter" countless times. And now I have two delicious- sounding Kleypas new books to look forward to; I can hardly wait. I do love following the continuing stories of Jamie and Claire, as well as Eve and Roarke. How about the continuing adventures of Quill and Calico from Goodman's "This Gun for Hire" or Wyatt and Rachel from her "Never Love a Lawman" for couples to follow up on? How exciting! It's been years since I first started reading this series - it will be fun to catch up with the characters and to meet the next generation. I think I'll have to re-read those first books again before the new ones come out! I've recently read Stephanie Lauren's Cynster Sisters trilogy - it was fun to catch up with all their Cynster cousins (including that Devil!). Like Janga I've been sooooo excited about MARRYING WINTERBORNE - this story has the Derek Craven/Sara feel to it! I can't wait! As for a couple I'd like to catch up with... I really enjoyed Derek and Sara in Lisa's novella from the WHERE'S MY HERO? anthology. And I always enjoy seeing Wulfric and Christine when Mary Balogh includes them in her newer books. I'm also on board with seeing some of Julie Garwood's couples - especially Johanna and Gabriel from SAVING GRACE and Judith and Iain from THE SECRET. I love knowing a new book is coming out. Even better getting to see characters I love later in their HEA.. well that's awesome! Waiting a whole year? Not so great. Love the way she introduced it! Glad to see the continuation! Unfortunately I haven't had the pleasure of reading any of Lisa's books. I can see that I need to get them and read them so I can see what I have missed. This is a wonderful idea. "Devil in Winter" is such a beloved book and to bring back the two characters in a new story is just brilliant! I am so excited to read "Devil in Spring." Congratulations and a huge thank you, Lisa. It's great to learn what Sebastian and Evie are up to years after their story. I loved DIW and have Marrying Winterbourne on pre-order. So excited to read Marrying Winterborne!